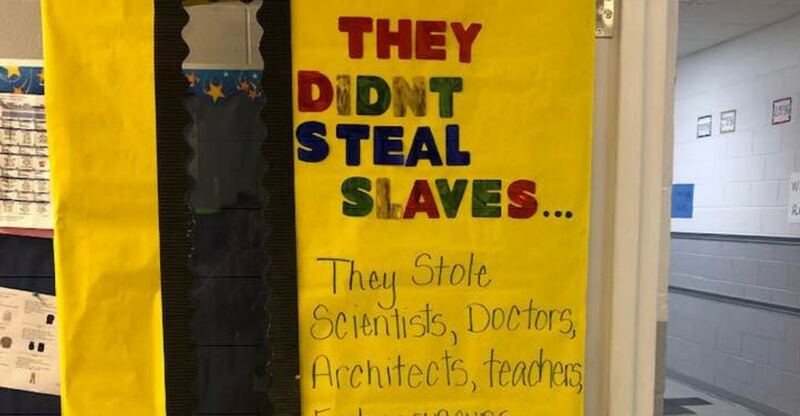 This teacher’s viral door decoration highlights a gut-wrenching truth about slavery. Black History Month reminds us that the story of America is not always told accurately or honestly. The common saying “history is written by the victors” is not necessarily true. History is written by everyone. We have written narratives of the defeated, the oppressed, the commoners, and the enslaved—we just don’t get to see those stories as often. Perhaps it’s more accurate to say that history is usually taught by the victors, which affects how stories get told, what parts are emphasized or deemphasized, and the language chosen to tell those stories. How history is shared and talked about and passed down through the generations makes a difference in how we view it. A combination of historical white supremacy and shame over the truth about chattel slavery has caused American history to be whitewashed in many school textbooks. For example, some books repeatedly refer to people who were enslaved as “workers,” which grossly dilutes the reality of what was done to them. Even the more accurate term “slaves” lessens those people’s humanity and removes the fact that hey had identities and cultures outside of their violently enforced servitude. Perhaps that’s why this teacher’s Black History Month door decoration has been shared more than 100,000 times on Facebook. Jovan Bradshaw’s door decoration highlights the vast human potential that was destroyed by slavery. THEY DIDN’T STEAL SLAVES…They stole Scientists, Doctors, Architects, Teachers, Entrepreneurs, Astronomers, Fathers, Mothers, Sons, Daughters, Etc. and MADE THEM SLAVES. It’s a simple but gut-wrenching account of the human cost of slavery, and a sobering reminder of the diversity of people’s lives destroyed by its atrocities. “Stay dropping knowledge,” Bradshaw wrote on her Facebook share of the photo. Bradshaw says the idea for the door started with a boy’s comment in her class. Bradshaw has been amazed by the response her door photo has gotten, and has said she simply wanted to shift her students’ mindsets about the history of their ancestors.